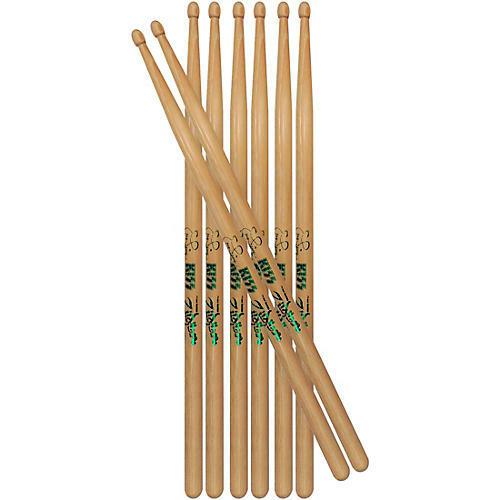 Rock-and-roll all night with these Zildjian quality sticks. This drumstick pack comes with four pairs of drumsticks for the price of three! The 2B-style Eric Singer drumsticks are made from select USA hickory drumstick with a long taper for response and fat tip for projection. Although best known for his many years playing with KISS, Eric Singer is a true veteran of the rock music scene, having recorded and/or performed with Lita Ford, Alice Cooper, Black Sabbath, Gary Moore, and Badlands. Eric also played with Paul Stanley on Paul's 1989 solo record and tour. Eric originally joined KISS in 1991, after the passing of Eric Carr, and remained with the band until 1996, when the original KISS reformed, including drummer, Peter Criss. Eric wasted no time and was back out on the road with Alice Cooper. He worked steadily until 2001, when he got the call to rejoin KISS and fill-in for Peter Criss. Eric spent most of 2003 and 2004 touring Australia, Japan, and the U.S. in makeup, rocking hard with KISS. More recently, Eric joined KISS in the studio to record Sonic Boom.